Both Bella and Christopher Robin are still around, and the camera usually catches one or both of them on the platform early in the mornings just after first light. 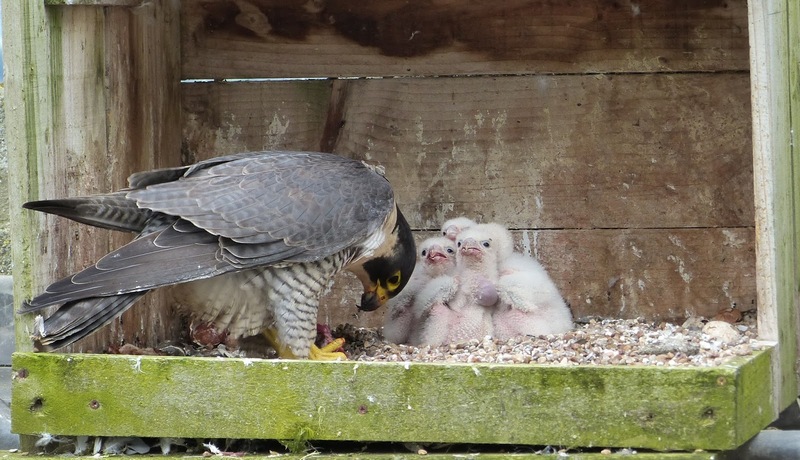 Because of the disappearance of Alice and the gap of several weeks before Bella arrived, it's now too late in the year for any peregrine breeding at Tewkesbury Abbey. Fortunately, we do still have a pair of birds, and if they stay together until the new year, may well have another attempt at breeding. Here they are having a little chat! Meanwhile, I'll keep this blog updated with any interesting sightings, and with the progress of Christopher Robin's brothers and sisters at Christchurch in Cheltenham. I will also try to get the audio recording working, ready for next year. Thanks to Dave Pearce, I was able to see the 4 chicks at Christchurch today. These are the 6th brood to hatch there, emerging from their eggs just over a week ago. They really do grow fast! I think this is something we will have to wait for another year to see at Tewkesbury Abbey. Bella - that wasn't very nice...! 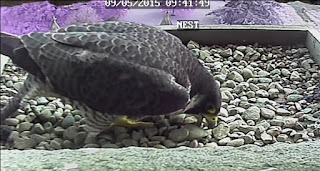 Still no sign of any eggs, but they are still courting as this early morning video shows. CR was first on the nesting tray, then he was joined by Bella. Both birds are still around, but unfortunately there are no eggs. Have they left it too late this year? CR's turn to make a scrape. While they weren't looking, I put some fresh gravel on the nesting tray, since they had managed to lose most of it down the crack between the planks.This is a larger grade than before, so hopefully it will last longer. Bella and Christopher Robin seemed happy enough with the extra gravel. Bella soon made a new scrape in the middle. ...and also by picking the odd stone up in her beak. Choosing a name for the new female is something we've put a lot of thought into. We can't name her Kanga, after the other female character in the A.A.Milne books, and other names which came up were Charlotte (after the new princess) and Lesley (the real life Christopher Robin's wife). Our recently retired Churchwarden at Tewkesbury, Mary Green, suggested Bella, and living on a bell tower, we thought this was the most suitable. Here she is inspecting the nesting tray. 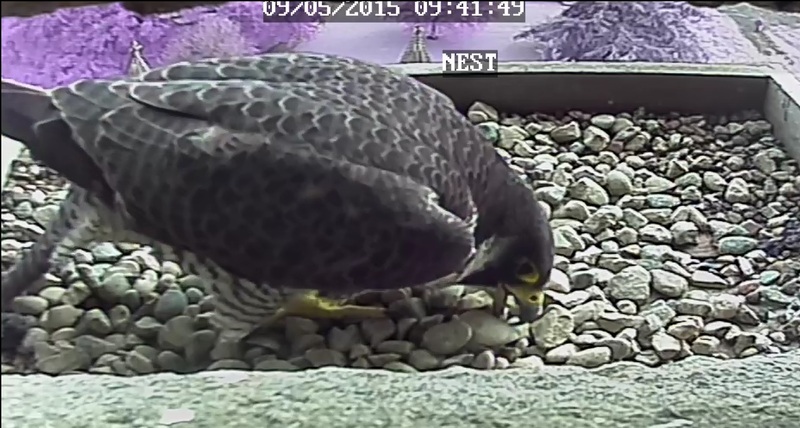 The camera captured Christopher Robin having an early morning snack. I can't quite decide what it is, possibly the remains of a starling? Graham Ainge kindly sent me this photo showing the peregrines mating on top of the tower! 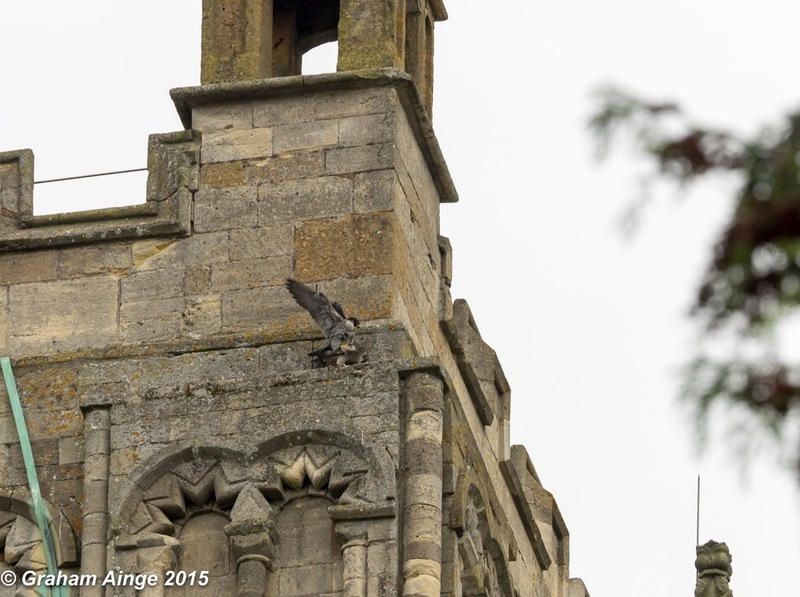 Our pair of peregrines are certainly making their presence felt! 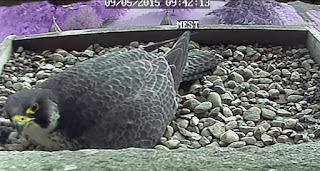 There is plenty of squawking, but there is no sign of any eggs being laid. Unlike some peregrine nesting sites, the nesting platform is not too high up and is easily visible from the lawns at the east end of the Abbey. 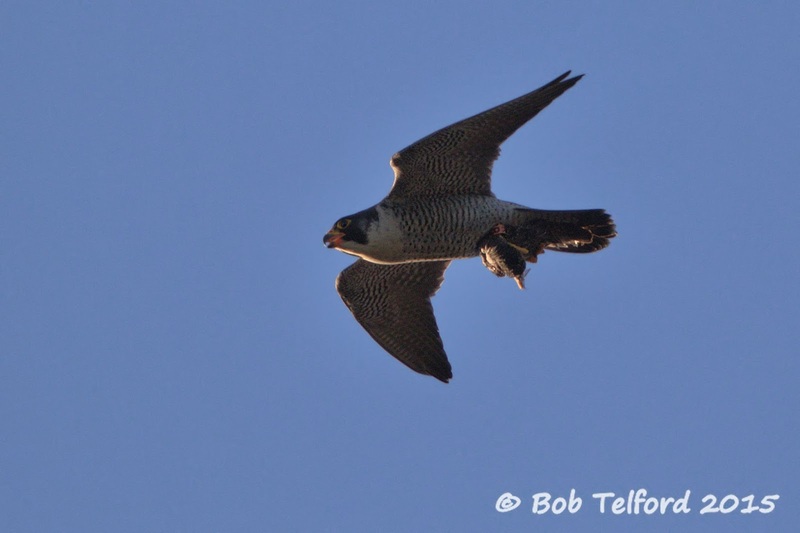 This makes it an ideal place to see and photograph peregrines without a powerful telescope or a camera with a big lens. If you have got the necessary camera equipment, then the results can be spectacular. Bob Telford took this photograph of Christopher Robin with a starling.